Joe-Joe is apparently a toucan or some other kind of tropical bird, and he apparently has his own line of oreo-style cookies at Trader Joe's. What toucans have to do with chocolate and vanilla creme sandwich cookies, I don't know. (I'm not sure what they ever had to do with fruit loops, either, but at least the colors on the toucan's beak were similar to the color scheme of the cereal). By that logic, perhaps a zebra might have made a better cookies n' creme mascot. Anyway...this ice cream is "cookies 'n cream" flavor, and it's very good, in my opinion. Sonia and I are both lovers of cookies 'n cream ice cream. It's the perfect balance of classic ice cream flavors with exciting cookie surprises. It's safer than something like "apple pie" ice cream or "strawberry cheesecake" ice cream, which, although tempting and emanating with potential, can be easily botched by an imbalance of ingredients or an improper pastry to ice cream ratio. Conversely, cookies 'n cream, though somewhat traditional, is not nearly as boring as plain chocolate, strawberry, or vanilla. It is the bar by which ice cream standards are set. Dairy science wizards and ice cream auteurs that can master the fine art of cookies 'n cream may then get set to tackle more advanced flavors, a la Ben and Jerry's, the world's leading minds in the world of dairy deliciousness. Like Ben and Jerry's, Joe-Joe's opposes the recombinant bovine growth hormone and will not use milk from cows treated with it. I don't know what it is exactly, but it is evidently quite sinister, and cows treated with it are downright unhappy. Anyway, the cookies 'n cream passes, at least in my book. TJ's, you may now proceed with caution in the development and production of more bizarre flavors. 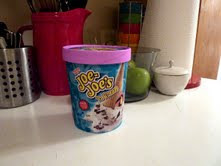 I give the Joe-Joe's 'n Cream Four and a half Stars. Sonia gives only Three and a half. Bottom line: 8 out of 10. A few years ago they Ustinov to have a great ice cream... Does anyone remember the brand?